Mark grew up on the Southside of Oklahoma city where his father would ride his motorcycle around town for pleasure and occasionally to work. Mark was around three years old when his dad gave him his first ride on that motorcycle, he still remembers the exact path they rode that day around the neighborhood. Little did his father know that the memory he created fueled a passionate fire deep inside for motorcycles. His father had a crash one evening going to work on a wet highway road, he survived with only bumps and bruises, but the bike was sold soon after and talk of kids with motorcycles was completely out of the question! When Mark was about ten years old he had a friend Brad Daily who owned a little 80 dirtbike. Mark’s dad told him not to ever ride that bike, but Mark being Mark, wanted to ride it anyway. So Mark asked Brad to teach him how to ride it, Brad put him on the bike and showed him how to properly release the clutch and give it gas. He gave it plenty of gas, released the clutch too fast and the bike popped a wheelie and drug Mark about 30 feet before he let go. Burning his leg on the exhaust pipe was the only injury he walked away with, as for Brad’s bike, it was hurt pretty good. Mark had to hide this burn from his dad for the entire summer, and he did that by wearing his socks pulled up to the bottom of his knees, which was pretty much the fashion in 1981. Around 14 years old, Mark met a guy named Gary, who loved to race, who taught him how to work on cars. Mark knew how to play guitar and traded Gary lessons for learning how to repair and rebuild motors. It was a great match and they worked together for about four years. Mark bought his first motorcycle when he was 18, hiding it from his dad while he was fighting the war in desert storm. It was a 1980 gpz that was stretched and had some minor work done to it, Mark painted it his favorite color blue. The acceleration of the bike was unreal at the time and the hook for motorcycle racing was set. While Mark owned a 1969 Camaro that was his daily driver and he street raced for awhile until he made Thunder Valley Raceway his home track when they opened in 1992. He was done with street racing and was at the dragstrip most weekends. Every paycheck that was earned went into his hobby of racing. The passion grew stronger over the years and In his mid 20’s he bought his second bike, a Yamaha Seca 2. Now this bike was not as powerful as his GPZ, but it was a perfect bike to run down the track to get use to the change to two wheels, which honestly takes a different type of mindset than a car racer. The speed wasn’t enough for him after the first year on the Seca and he traded it for a 1995 YZF 600. Now that was a huge power difference, from running 14 seconds to now 11.50’s. As he got use to that bike, Yamaha produced the Thunder Ace 1000cc in 1996, and he had to have it, there was a lot of hype about how fast they were. 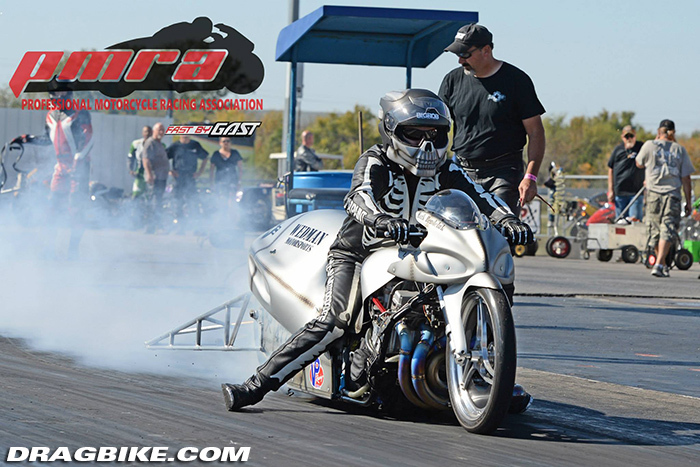 He traded the 600 for the 1000 and hise first pass off the trailer was a 10.90, he was able to work down to consistently running 10.20’s at 135mph with only an aftermarket exhaust added to it. Then in 1999 you all know what came out from Suzuki, the Hayabusa! Mark was no longer a Yamaha guy. He drove down to Plano Texas from Oklahoma City and picked his up from the Plano Fun Center. This was the bike that changed racing for Mark. When he took it ran 10.20 at 142 mph, he was amazed at the smooth acceleration and handling it had. Marks’ Son Haylen who was born in 1998, had the same gear head as Mark and was always out in the garage watching him work on his bike. The two were inseparable when he was young and he would take him on rides around the block on the bike, Haylen used to ask him to take him to school on the bike, so during his elementary years, Mark would take him to school and pick him up in the afternoons on the bike. Haylen would seem to walk a little taller on the days Mark would take him on the bike. In 1999 Mark decided to open his own business up, a paint and Body shop calling it Mr. Paint. His father Bill Rendeluk suggested M.R. Paint after painting his father’s motorcycle once, Mark was telling his dad that when he signed his name on his work it was too long, so his dad suggested using his initials, bam! Mr. Paint was Born! Mark had a boat he had custom painted in 1999 that he put up for sale because he was looking for a drag bike, a guy out of Grinnell Iowa had a Super Comp drag bike he wanted to trade for the boat, Mark made the deal, and this is where drag racing legend Big Carl is introduced to Mark. Mark took his bike to Big Carl, whom he was told, was the baddest bike builder in town. A great friendship developed between Big and Mark, as Mark’s shop was right down the street from Motorcycles Unlimited. Mark spent his lunches, after work, and weekends at Motorcycles Unlimited learning as much as he could about motorcycles. Big Introduced Mark to several legends in the sport, Kenny Annesely, Larry Mcbride, Chris Hand, Marion Owens, and Ron Webb. 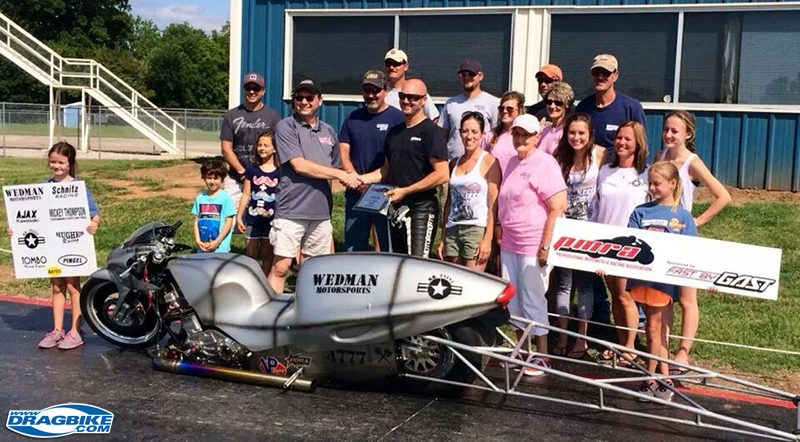 He even talked Webb into letting him repaint fire and ice top fuel bike. Big was like family with Mark and as the years went on, Big became sick and passed away. Big’s family asked Mark if he would bring the Super Comp bike out and fire it up graveside one last time before they lowered him into the ground. Mark raced several years with Big’s help before getting his first PMRA Series win in 2002. It would be five more years before his next win, and by 2009 he won his first championship. 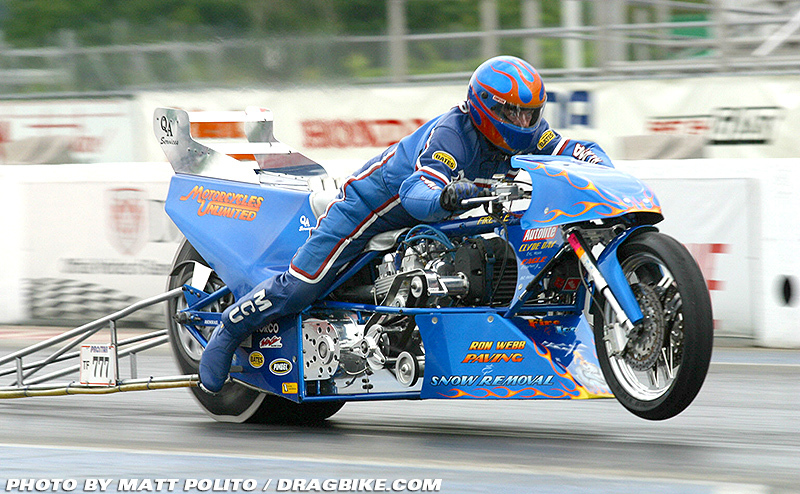 With three Super Comp championships under his belt by 2010 from two different series, he decided it was time to step it up to Top Gas. After Big passed, Mark set out to find a new Mechanic to work on his bikes, this is where Chris Wedman and Mark started working together. Mark found a bike in Ohio and traveled up to get it from Brian Shields, it was a beautiful Athanis Pro Stock chassis that was perfect for Top Gas. When he brought it back to Chris, they went to their first race and runnerd-up breaking out by 1000th of a second. 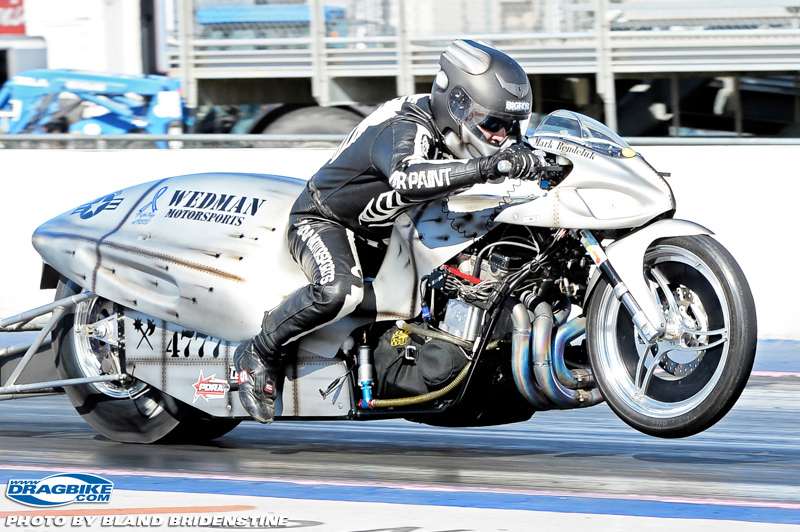 When they got back, Chris and Mark started talking about running Pro Open and turned the bike up and Mark ran his first 7.90 pass, it was the rush they both needed to push them forward into the class. With lots of broken parts and lessons learned, Paul Gast started helping us with our tune-ups and information to get us into the 7.0 range. However the weight of the bike and the short chassis were preventing them from reaching thier 6 sec goal. 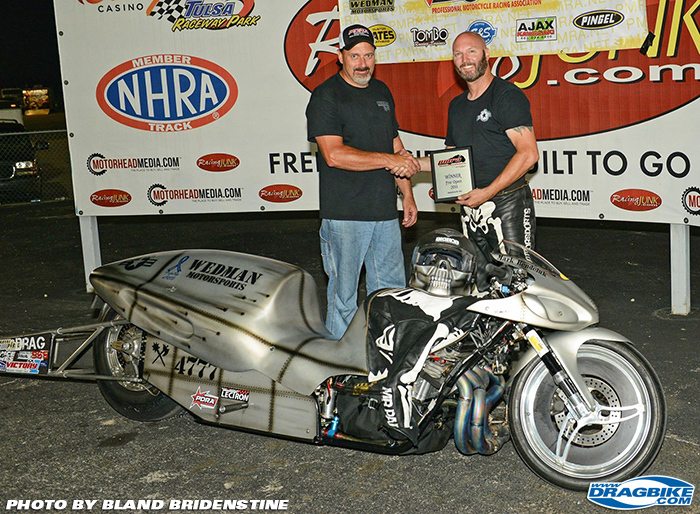 Mark was then introduced to Walt Timblin for a chassis, we’ll this opened the door up to new opportunities of information with people of the Pro Mod world, after receiving the chassis Mark won his first event on the new bike running a personal best every pass on it, down to a 4.21 in the finals. Tthe next race Mark and Chris won their first Pro Open championship and ran his first 6 second pass at 6.80! The next year Mark was introduced to Dan Wagner who taught him more about tuning than he could absorb. A wealth of knowledge Dan was to Mark and Chris’ program, getting them down to consistently running 6.70’s. Mark started traveling to the middle east with Dan Wagner, working with him to learn more and help sharpen the skills needed for Mark And Chris’ program. Now they run 6.6’0s with ease and have been a 6.52, even setting a mph record in Pro Mod with a 207.27 mph in Gillam Louisiana, October 2014. 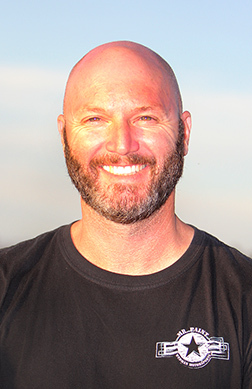 In total Mark has won eight championships, five of them have been with his Crew chief Chris Wedman, the biggest reason to why the bike is so consistent is Chris’ sharpness and his knowledge of how to keep the bike running smoothly. They have grown together in the sport. Now working with Eddie Krawiec at Vance and Hines, they are now able to work with the best in the sport. Vance and Hines is helping them improve their program by providing parts that allows them to be on top of their game. 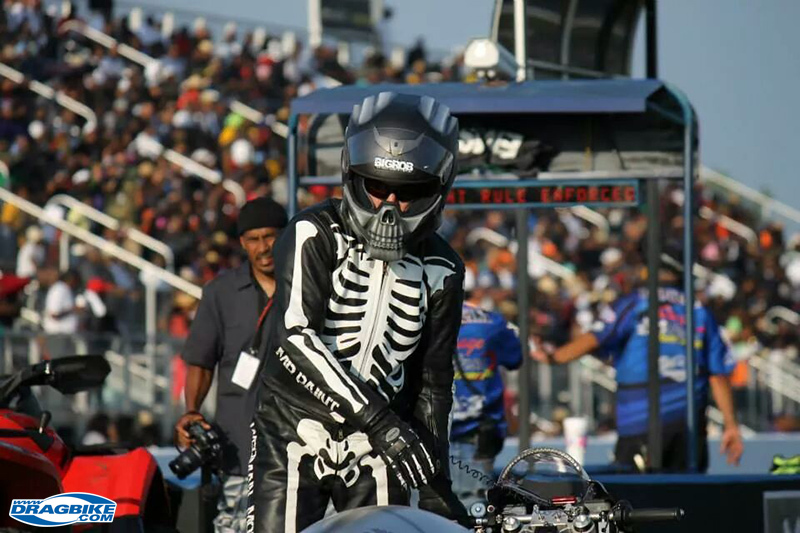 “I am proud of how far we have come in the racing world, in what I feel has been a short time in Pro Mod. I couldn’t have done it without the great people I have met. I feel it was no mistake that this is where we should be at this moment in time” said Mark. Person of the Week is brought to you by Pingel, visit them for all your performance product needs.